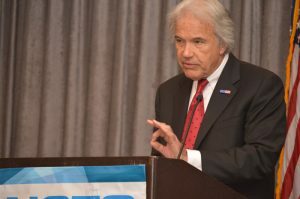 At the 15th annual NCTO meeting, outgoing Chairman William V. McCrary Jr. painted a picture of the U.S. textile industry and the association`s achievements and upcoming goals. By William V. McCrary Jr. It has been an amazing year for the U.S. textile industry and the National Council of Textile Organizations (NCTO). President Trump`s pro-manufacturing agenda is forcing Washington to do what NCTO has long sought - rethink policies on trade, taxation, regulatory reform and a host of other issues. Let there be no doubt. The time for change is now and NCTO is committed to working with the Trump administration to achieve the best policy outcomes on these and other issues. But before laying out NCTO`s policy agenda, I want to recap how the industry fared in 2017.